← Bible contradictions #1: Does god lie? 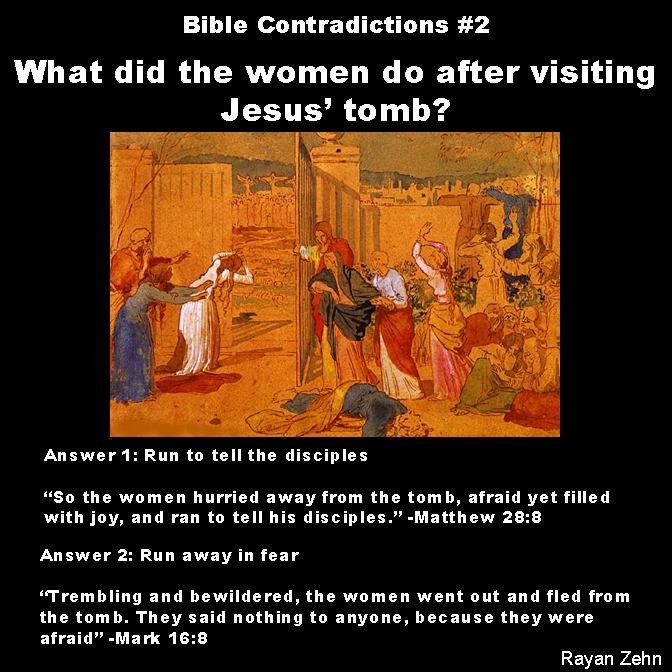 Bible contradictions #2: What did the women do after visiting Jesus’ tomb? The women who witnessed Jesus’ crucifixion, his burial, and the discovery of the empty tomb play a major role in the resurrection myth. Why then is there such a major discrepancy between the gospels when it comes to what the women did after discovering that the tomb was empty? Unfortunately, the bible gives us no answers. This entry was posted in Atheism, Bible Contradictions and tagged Atheism, Bible Contradictions, Christianity, contradictions in the bible, crucifixion of Jesus, empty tomb, God, God of Abraham, Jesus, Jesus' crucifixion, Religion. Bookmark the permalink. 4 Responses to Bible contradictions #2: What did the women do after visiting Jesus’ tomb? Bible Contradictions #2 is in. Hey David, I’m going to do a post announcing to my followers and other readers that you’re doing these rebuttal videos. I was typing it up and realized I don’t know what to refer to you as. Usually I call people who rebut these contradictions ‘apologists,’ but if you’d rather me refer to you as something else go ahead and let me know here. I want to be as respectful as possible since you’ve offered me the same respect. Best regards, Rayan. Hey Rayan, Apologist I think is the general accepted term for these matters, that is defending against an argument. Ultimately I’d say you could call or label me anything you like, I don’t get so easily offended 😉 In fact “Christians” teach falsely on judgements. They always say judge not least ye be judged. Matthew 7:1 Judge not, that ye be not judged. is where they get that. The problem with the Church today is they have twisted the scriptures up so bad it has made it blatantly clear there’s contradictions in the faith, not in the scriptures, well none I’ve come across yet, at least to the level I can logically explain them away. The following verses in Matthew say 2For with what judgment ye judge, ye shall be judged: and with what measure ye mete, it shall be measured to you again. 3And why beholdest thou the mote that is in thy brother’s eye, but considerest not the beam that is in thine own eye? 4Or how wilt thou say to thy brother, Let me pull out the mote out of thine eye; and, behold, a beam is in thine own eye? 5Thou hypocrite, first cast out the beam out of thine own eye; and then shalt thou see clearly to cast out the mote out of thy brother’s eye. In short, don’t judge hypocritically, judge righteously. Any who, sorry for side tangent teachings. If you needed to label me anything I would say a Bible Believer, or believer in the Scriptures, follower of Jesus Christ, something to that degree. I don’t like to think of my self as a Christian in the normal sense, as since I came to the faith and was a newborn in Christ, I got filled with a bunch of man made doctrines. Over the next several months and reading my Bible, I realized how un-biblical Christianity is. If one says they are a Christian, the recipient then will view them as in a category of one of the 40 or so denominations that reformed out of the Catholic Church. What I believe and what the every day Christian believe are two cataclysmic different things. I am glad we can be civil and respectful with one another. Actually I have found thus far, the unbelievers are usually more respectful than the believers. The believers will often defend their belief with such righteous fervor, get angry about it and never even listen to my side of the argument. Been having these now days across many forums. Any who, sure you don’t want to read a book long post by me, so I’ll cut it here. Also I think its cool your promoting these videos. It allows people to see both sides of an argument. If people only ever hear one side, that’s conditioning. Let the people decide what is true.